The Divine is the only support that never fails. Delicate pendulous clusters of small light lavender star-shaped flowers with yellow anthers, accompanied by lavender buds. 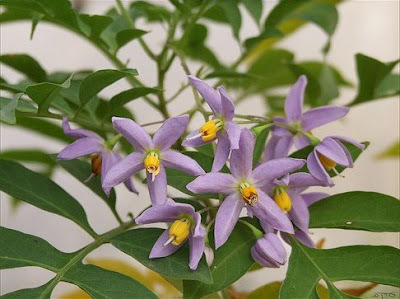 A slender long-flowering vine with deeply cut leaves and ornamental clusters of round shiny green berrylike fruits that turn orange to bright red when mature.